Add a splash of colour to your table with our JELL-O Sunset Salad. 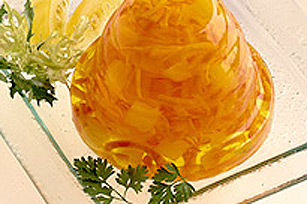 Made with lemon jelly and a few simple add-ins, this JELL-O salad is the perfect addition to a family gathering. DISSOLVE jelly powder and salt in boiling water. Add pineapple with juice and lemon juice. Chill until slightly thickened, about 45 minutes. FOLD in carrots. Pour into a 8-inch (20 cm) square pan. Chill until firm, about 4 hours. TO serve, cut in squares and place on salad greens.